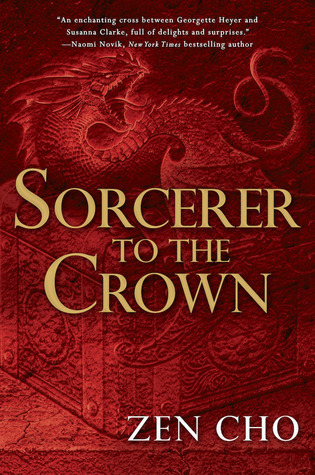 If you remember my post about Zen Cho's short story collection Spirits Abroad, you'll know that I was super-stoked about Cho's full-length novel coming out, Sorcerer to the Crown. I got an advance copy of this book through the help of fate and magic and pure luck, and so now I can tell you ALL OF MY FEELS about the novel! 1. It is set in late 18th/early 19th century England. 2. It is a fantasy novel. 3. The main female character is half Indian, and that half is from southern India. 4. The main male character is a former slave. 5. The other kind-of main character is an old Malaysian woman. Actually, now that I review the list, I feel like those are five things that would probably make ANYONE want to read this book, though I understand some people don't love fantasy and some people don't love historical fiction, and even though that is my ideal combination of all sorts of books, I know that is not the case for all of you. In general, I feel sorry for all the amazing stories you are missing, but I get it! I am probably missing BOATLOADS of awesome stories because I veer away from "literary fiction" and women's fiction. Anyway, back to Sorcerer to the Crown. The story centers on Zacharias Wythe, a freed slave with super-impressive magical abilities who, much to everyone else's chagrin, becomes Sorcerer Royal of England. But magic seems to be leaving England, and Zacharias faces opposition and threats from everywhere, not least from some tiny island nation in the Pacific where vengeful female ghosts are attacking the populace. Luckily, he meets a beautiful and amazingly talented woman, Prunella, who technically shouldn't practice magic but is really good at it, and the two set off to make everything better. I admit that if I had a slight problem with this book, it was in the character development. There are just a lot of people in this book. And while I enjoyed spending time with both Zacharias and Prunella, and I think they were both awesome, I wouldn't say that they were fully fleshed out, complex people. I would have liked to dig a little deeper with them. But maybe Cho just had so much going on in terms of setting the scene and introducing the magical elements and explaining the class/gender/race relations between everyone that there just wasn't enough time to also develop the characters that well. What I knew of Zacharias and Prunella I liked, but I hope that in future books, they are more full-fledged oil paintings than pencil sketches. But seriously, I liked so many other things about the story! One of my favorite things about Spirits Abroad was the way Cho infused all her stories with Malaysian culture, from using dialect to describing food to incorporating folklore and so much else. She does the same thing here, even though the book is set in London and the main characters are not Malaysian, and I love that. THIS IS WHY DIVERSITY IN PUBLISHING IS SO IMPORTANT. How many people would think to combine Indian history with Malaysian folklore, add a healthy dollop of English Faerie, and then make light but awesome references to equal rights for women and people of color? Not many. And the feminism, it is awesome. There so many different women, most of whom wield different sorts of power that complement and contrast with one another. And Cho doesn't just hit you over the head with the feminism, she really just kind of pokes fun at history and pokes holes in its rules, and it's a lot of fun. And then she also shows how women in different cultures (English, Malaysian, Indian and, er, faerie) push against their boundaries even while working within their cultures. And then there's the race stuff, too! I think Cho maybe could have gone further on the race component than she did, but this is a pretty light book, so I can understand why she didn't. Suffice it to say that Zacharias (and, to a lesser extent, Prunella) never forgets that he is different, and so much of his personality and actions are informed by that fact. He's always a complete gentleman, and utterly polite to everyone, so that no one knows just how frustrated and angry he is. All because he doesn't want to give them any reason to remember how different he is. It's subtly done but so powerful when you catch on. Note: This review is based on an advance reader's copy. I received an e-galley of the book in exchange for an honest review. Awesome! I got an eARC and am so excited to get to it. I may just have to save it for A More Diverse Universe! Sounds great. I'll add it to the TBR. Hurrah! I have this on my Nook and have dipped into it a few times without actually finishing it. I want to save it and relish it -- I mean really what I want is a cool sunny day where I could go lay outside on a blanket and read it in the sunshine. But that's an unrealistic desire. Stupid summer. For some reason this book is 30 bucks at the moment, so my plan to pre-order it has been side-tracked until the price gets better. Or I get an e-copy!